Features two cutting heads with four different cutting tools mounted on the same head for instant selection. Easy glide cutting action, prevents damage when loading sheet materials, minimizes operator fatigue and increases production. The top Twin Wheel Cutting Head cuts 1/8” uncoated masonite and mat board. A standard medium duty utility blade accurately cuts Foamboard, Gatorboard, Sintra, corrugated cardboard, honeycomb plastics up to 1/2” thick. 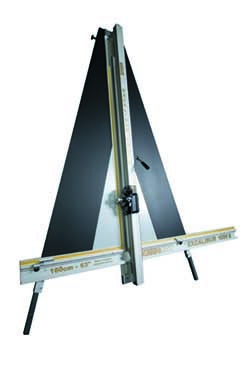 The scoring blade is used for acrylics and other rigid plastics. The tungsten carbide cutting wheel scores glass and mirrors up to 1/4” thick. Features a single sliding counter-balanced head with 3 cutting and scoring tools ready for instant use. 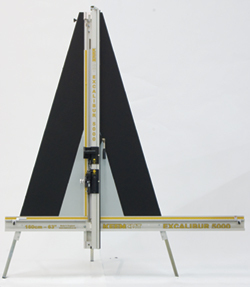 With a rigid clamping system, a set-for-life squaring mechanism and the standard wall mounting or optional free-standing kit, the Excalibur 1000X provides a noiseless, dust-free and cost effective cutting solution for materials used in a modern sign or graphic workshop.